On August 1st, 2014, we revealed all of our 2014 180 Medical College Scholarship winners. Thank you to everyone who applied. We had so many great applicants this year, and our scholarship committee had an extremely difficult time judging. We couldn’t pick just five, so we awarded NINE individuals this year! A big thank you goes out to our founder and CEO, Todd Brown, who has such a passion to help young students achieve their dreams. Throughout the next few months, we will be highlighting our individual winners on our blog, so stay tuned! 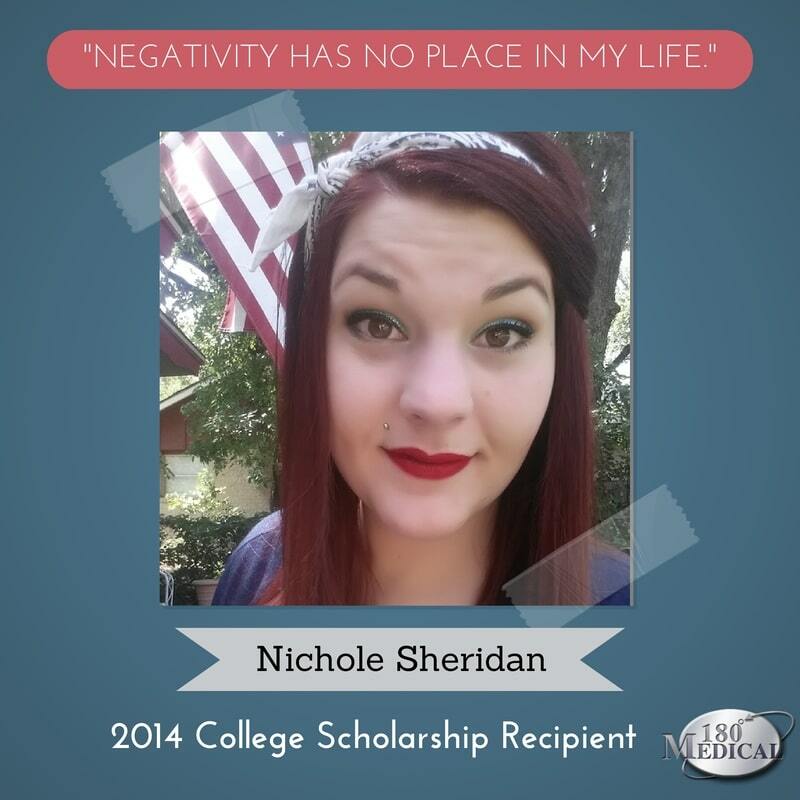 This week, we are happy to feature one of our scholarship winners, Nichole Sheridan. Nichole, a 20-year-old junior majoring in Interdisciplinary Studies at the University of Texas in Arlington, was always a healthy and lively child. Her family even nicknamed her “the Energizer Bunny” because of her active, non-stop drive. Then one day, when she was just 13, everything changed. Within the course of one week, her body began to lose strength. She couldn’t even get up from bed on her own. After multiple hospital visits, tests, scans, and more, she found out what was wrong: she had Transverse Myelitis/Myelopathy. Ultimately, her goal is to help others who have Transverse Myelitis or other challenges get through the rough patches and let them know that a full life is still possible, even in a wheelchair. She wants to use her education and experience to inspire others as a leader of a nonprofit foundation or charity. In the meantime, she also spends her free time writing on her website and blog at www.shewillnotfall.com. Transverse Myelitis is a neurological disease where the spinal cord becomes inflamed. Those affected will usually experience the symptoms suddenly or over a short period of time (usually within days) at the onset. Signs of Transverse Myelitis include weakness and/or numbness of limbs, back pain, paralysis, sensory loss, and motor deficits. Nichole’s life story is certainly an inspiration to us, and we are so pleased to be able to contribute a piece toward her future dreams and goals! 180 Medical’s scholarship program was created to help those with spinal cord injuries, spina bifida, transverse myelitis, and/or a neurogenic bladder afford college. To learn more about 180 Medical’s College Scholarship program, visit www.180medical.com/Scholarships.